It would be fantastic if MLV app had an option that combines the movie clips together when converting so it will be one whole file not many seperated. Why not using a NLE? For MLVApp this would only work if all clips had the same resolution - to check all this would make it complicated and would also limit the resulting functionality. There has to be a better way than color correcting in the mlv app? What's the point shooting in raw when you have to color grade prores in davinchi or basic grade raw in the mlv app? Okay you have the ability to get a prores file from your dslr wich normally isn't possible but then again you could also use a external recorder to record in prores. It's not impossible this way but really inconvenient watching compressed footage and manually stretching them, someone has to have the ultimate workflow for this right? Well you have to choose the workflow that works best for yourself. You can't blame others for using and develop the software they want to use. If you want to try it and are a Windows user, you might try raw2cdng by Chmee and import directly to Resolve 15. Thats the process I've changed towards over the years, and find convinient. You don't have to use it just a tip/advice but it takes time to learn atleast for me over the years. But the fun thing about it is that my 5D3 feels more and more modern the more Black Magic develops Resolve. But you shouldn't bash here at them in a MLV app that they are developing themself. Edit: Lol sorry for the passive aggressive reply. But my point is that MLV App is perfectly capable of producing a cinematic image out of a good shot, and in my opinion this video is a better result than many people get with davinci resolve etc. It just takes effort and practice to get nice images, not the best software. The main thing for good looking images is having smooth highlights, in my opinion and MLV App can do that pretty perfectly. And you can add a lut in MLV App if you like that style of colour. And I admit MLV App is still not colour accurate, also the that video is not very detailed (it's more about colour). An external recorder will still give you cr4p 8 bit colour depth the prores doen't help. I'm sure there are plenty of people like myself with great appreciation for mlvapp! Yes, resolve can do more for very poor footage, but it's a different beast altogether. Mlvapp is GREAT. I have no problems getting fantastic results with it! I am one of these people. Since most of the time I use older computers which do not support Resolve at all, my only alternatives are MLVApp and MLVProducer. They both work very well for me. I use Producer when I need fast export times. It works pretty fast with the ProResFast444 option. In all other cases I use MLVApp since it really provides excellent results in post processing. I want the developers of these two pieces of software to know how much I appreciate their expert work and how grateful I am for all their enormous efforts. Keep up the good work, guys and enjoy the appreciation of the ML community! I just read that BMD gave out source and all for their new Black Magic Raw codec and is available to developers. Do you think it is possible to implement it in your already more than awesome MLV APP? As I understood one of the main differences is that you get one file instead of separate cDNG frames in folders, which are harder to move around disks and harder to read so you get slower previews because of data bottleneck there. MASC and other developers of MLV APP thank you for this amazing tool. BMD Raw is not an interchange or container format. It is only recordable in the camera (and probably in new external BMD RAW recorders). Like ARRI Raw, ProRes Raw etc there is no BMD Raw output codec other than when trimming original BMD Raw files. You can't render to BMD Raw from Resolve. I suspect this has come about as a way to reduce licensing costs when incorporating ProRes. They simply get rid of the Apple codecs altogether. Smart move but could backfire if other NLE vendors don't support it. I wonder what this will do for official ProRes support in Resolve in future as BMD Raw is a direct rival to ProRes Raw. MLV App causing this scan lines in the Sun when processing Dual ISO files. Any way to avoid it? Edit: The SDK is decoder only. So unfortunately there is no way to support it as encoder. Filming directly into the sun often causes problems, also without dual iso (brings a black dot in the middle of the sun). I think the only way is to avoid to film into the sun, or tracking the sun in post and attaching e.g. a bright circle on it (possible using Resolve). Masc and Andy600 thanks for your replies. @70MM13: jp2000 export in mov container is added to MLVApp. You can compile it or wait for next release. You can then choose between the options .jp2 sequence and .mov when codec JPG2000 is selected. That would just be drag&drop in QtCreater for these 2 actions. But would you really use that at this position? Isn't the rightclick menu better (jumps to the position where you clicked when zooming in) or typing "F"? I didn´t reaize, that it can be done with right click. That´s fine for me. Thank you for the hint. 0.33 (0.333 more accurate value) for 1x3 Binning and 3.00 for 3x1 Binning. Or maybe making these stretching values changeable with a double click? Sure, that should be possible. Is there a way to read out the ratio from the MLV yet? For 5x3 it was possible and we could set it automatically. What sould be the expected values, if they are set? 3 and 1, 1 and 3? /* Get image aspect ratio according to RAWC block info, calculating from binnin + skipping values. }Edit: I need some sample MLV for testing - 1 or 2 frames with each possible factor are enough. Hmm... Are 1x3 and 3x1 binning modes still supported in latest crop_rec.mo? I added the new factors to the repository on github. I don't know if autodetection works - I have no test clips. Please upload some short clips (some frames are enough) and/or test! Thx! In the new method of crop_rec now we have it (1x3 and 3x1 binning) essentially in crop_rec. @togg: I remember, nearly a year ago I recorded a sync test when we started implementing audio. I had one clip where audio was 1fps earlier than video. But: that means when syncing it correctly, there is no audio for the first frame - or we would have to cut away the first frame. There is only a very little more audio than video in a MLV. We decided to sync it by using the timecode (therefor we had to cut a very very little in front and in the rear of the audio channel, if I remember right, or only in the rear?!). Nobody really knows, on which position the audio is more correct than using the timecode... here a screenshot from my clip, it is the same with yours? @bouncyball: you remember the little book sync test?! Here I am again. I've cutted an MLV and tested it, as you can see the audio is offsync by minus 1.5 / 2 frames. I feel like it is a stable offset, it is not drammatic but for me slow things down especially if you're in a shooting situation where you doesn't have a clap, you have to know the issue beforehand to not make a mistake. 2 frames out of sync is a lot. Also I've tried the new version! I'm happy that multithread was implemented but for now I can't see any speed improvement in export, maybe even 1mb slower, which is kind of weird. it stays to 18MB/s on write, I've tested it with multiple read and write locations. I'm using a 2012 rmbp with an i7 and dedicated gpu. Also, a super important thing for me would be to have the option stick when closing and opening the app. I'm thinking about the vertical stripes correction and hot pixel correction. Thx! Auto detection works! Nice! @togg: thx! I will download and analyse your clip later. The speed point: v1.0 has many new parameters, so it might not feel faster, because they have to be calculated as well (if you use them). The new multithreading affects mostly RAW Corrections (e.g. try out chroma smooth 5x5). If only preview is faster: maybe you chose a faster debayer for preview than for export. Or do you export cdng? Then you won't feel much - exept RAW Corrections are enabled. Could you please explain - I don't understand that point. All options are saved into the session and should be the same after opening again. Just use Open and Save. 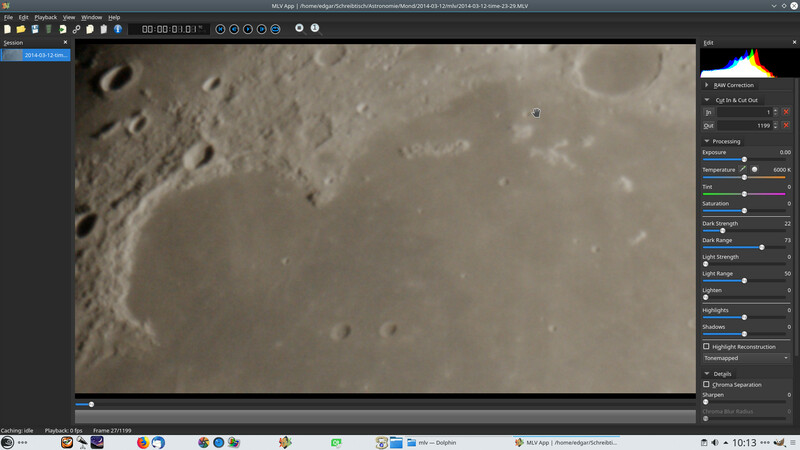 Here is the @togg's clip rendered to h264 mov. Do you really think it is out of sync? I have been experimenting quite a lot with processing Dual ISO footage on the MLV App V1.0 lately and have to say that it does an excellent job with converting, correcting and saving such files to ProRes. I love the new sliders and the denoise function! Rendering speed is also faster compared to version 0.17. Fantastic software, providing stunning results! Thank you so much, guys! Yes, check in in any NLE. It is out of sync by 2 frames. It is not that noticable with a slate but for lips it become more obvious, anyway if you check in in an NLE you can see where the audio spike is and where the slate hit, audio is - 2 frames.